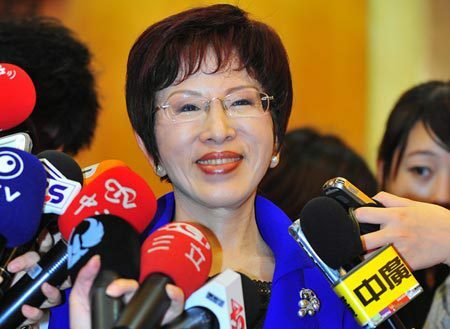 Hung Hsiu-chu has received an average approval rate of 46 percent, qualifying her to be the Kuomintang (KMT)'s only candidate for Taiwan's 2016 presidential election. Hung is expecting the KMT to formally nominate her on July 19, during the national party convention. Once she is nominated, she will be running against another female, the Democratic Progressive Party's (DPP) Tsai Ing-wen , who resigned as her party's chairperson after Ma Ying-jeou was re-elected as president. “I hope this battle between two women will bring forth a whole new understanding and set an example of true democracy,” Hung tells reporters. President Ma says he will support whichever candidate the KMT nominates. "As a member of the KMT", says Charles Chen, the Presidential Office spokesman, "President Ma will extend his backing to the candidate nominated by the party." As China has recently planned to remove travel restrictions for Taiwanese citizens, Hung vows to further improve Taiwan's relationship with China has described those who participate in Taiwan Independence Movements as separatists. “This separatist ideology is a threat to Taiwan’s national security. It will put Taiwan in further isolation and stoke more hatred and polarization in the society,” Ms. Hung said last week while presenting her campaign platform at the party headquarters, reported by WSJ. Many young Taiwanese voters still see their island as an independent country. The voting process begins on January 16 next year and the new president will officially take office on May 20.